Home » October Unprocessed Posts » Congratulations to the Graduating Class of October Unprocessed 2013! Congratulations to the Graduating Class of October Unprocessed 2013! Well, we did it!! What a month it’s been. 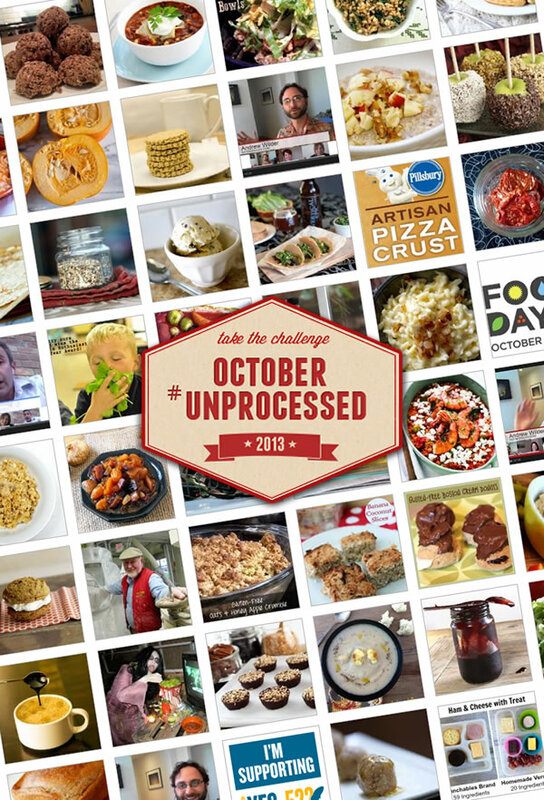 At last count, 15,546 people signed the October Unprocessed pledge, more than 2,000 people joined our vibrant Facebook group, and we shared 44 guest posts throughout the month. It’s staggering the number of people who came together and volunteered their time, expertise, and talents to help make this project happen. First and foremost, I want to thank all the guest authors. Their contributions.were mouth-watering, creative, beautiful, helpful, and so much more. Here’s an index of all of the guest posts. I’ve said it before, but it bears repeating: The food blogging and wellness community is one of the finest groups of people I’ve ever been blessed to know and be a part of, and for that I am truly grateful. Thanks go out to Suzanne Elizondo, for updating our October Unprocessed Guide, joining in and helping coordinate our Google Hangouts, and lending a hand with the Facebook group. Thanks also to Sabrina Modelle from The Tomato Tart, who designed the wonderful logo and shared her salted caramel macaroons. I’m grateful to everyone who helped spread the word about the challenge — including so many bloggers and journalists. Every blog post, article, Tweet, and Facebook share made a huge difference. I’m indebted to Trina Kaye, my fabulous public relations guru, who helped spread the word about the challenge (and got us on radio & television!). And to the talented and enthusiastic Rene Lynch at the Los Angeles Times, who has not only championed the cause every year, but also embraced the challenge herself. Finally, thank you to everyone who took the challenge and participated in any way – including those folks who weren’t ready to sign the pledge, and just read along all month. This challenge is really all about all of you, and I hope it’s been a wonderful experience. Now tell me, how’d it go? I suppose you’re wondering how I did on the challenge? Of course, I had a pretty good idea of what I was getting into, having done it four times before. This year my own goal was to use our Vitamix every day of the month. I didn’t quite make it happen every day, but I won’t call that a failure — I used it quite a lot more than ever before, so I’m proud of myself for that step forward. Indeed, my smoothies with carrots, spinach, banana, apple, frozen fruit, and chia seeds really did help get me through this month. I also discovered that a small chunk of fresh ginger root is a phenomenal addition to a smoothie! I highly recommend it. So now it’s your turn: I’d love to hear about how this experience may have changed you. What will you take with you into November and beyond? Please share in the comments below! PS – I’ll be putting together a more formal survey in the next few days, so if you have specific thoughts and feedback about the challenge itself, that’ll be the place to let me know. I’ve done that in the past and it’s been tremendously helpful – I consider all of the feedback very carefully! Wow, did the month fly by! I came close to my goal of eating at least 80-85% unprocessed, have tried new food and recipes, learned many new things. I now read all labels when shopping and will continue to do so. I can honestly say I do not know if I will ever be 100% unprocessed but I will be close. Thank you for creating this event. I am looking forward to learning even more and continuing to eat as unprocessed as possible. Hello.will there be another challenge anytime soon? Hi Gary – Although I officially lead the challenge each year in October, there’s no reason you can’t do it on your own. Better yet, get a few friends/family/co-workers to join you. 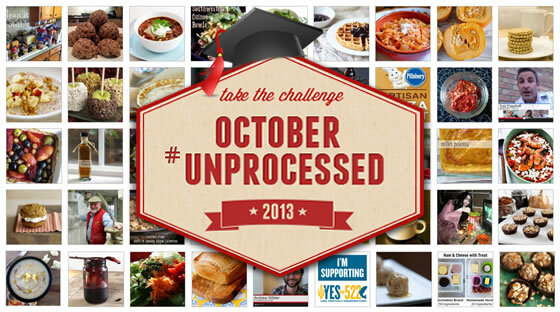 Why not start today, and make November your month of Unprocessed? Also, our Facebook group will be continuing on, so you can find extra support from the awesome people over there. This was my second year of the challenge, and I think I did so much better this go-around because I focused on what I WOULD eat, not what I COULDN’T eat. And I’d already done so much label-reading from last year that it wasn’t nearly as time consuming this time. It’s a great exercise, and I plan to keep dropping as much processed food as possible all year long. Thanks, Andrew! This is a great insight. Changing focus in this way helped me to meet my goals this year (I didn’t quite make it last year). It also kept me from celebrating with forbidden foods on Nov 1. So far, the desire to eat candy corn, fast food, etc has not come back. Congrats to us all! !